No it’s not an alien spacecraft. 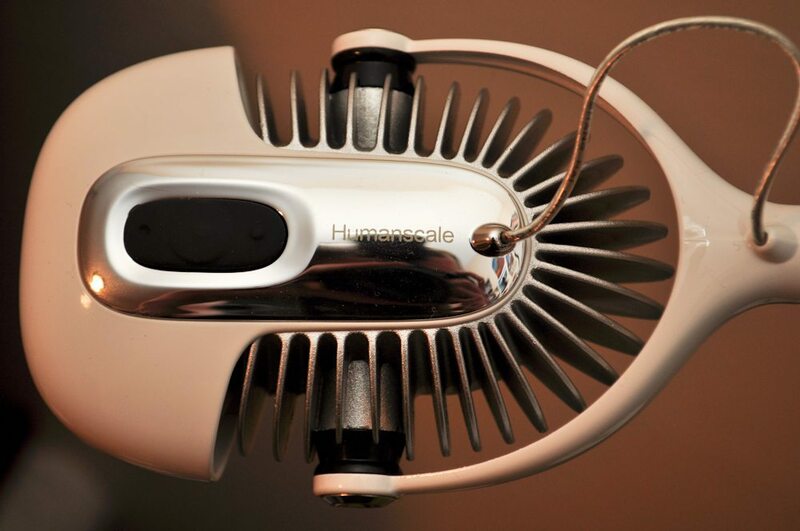 Enter the Humanscale Element LED task light. The Element lamp produces neutral, 3500K white light that’s clean, crisp and a definite eye saver. The lamps single LED casts just one shadow, unlike other lamps with multiple LEDs which create multiple shadows on your work surface and hurt your eyes. Being that it’s good for 60,000-hours the bulb will probably never need replaced. If you burned the midnight oil and had to replace it, know that it is very user serviceable. Oh and the light is oh so very green, consuming just 7 watts of energy while putting out a plethora of clean light. If the direct energy savings doesn’t convince you maybe this will. The Element is made up of up to 81% recycled aluminum and plastic, and is 99% recyclable if you ever needed to recycle it. The design is incredibly ergonomic with a 360° swivel base, a maximum reach of 28”, and a maximum height of 28”. The head unit can rotate 90° side-to-side, and tilt front-to-back 135°. My favorite feature is the smooth counterbalance system that allows for easy adjustment without anything to tighten. Some task lights get scary hot, the Element’s cooling fins keep this light cool to the touch. No halogen, dorm room, burning potential here. I love this task light. It’s elegant, simple, perfectly designed, eco-friendly, and it puts out perfectly clean white light. Need more convincing. The Element light received the Best of NeoCon Gold award at the NeoCon World’s Trade Fair last summer. Available in white and silver or all silver, and can be paired with one of 19 mounting/base options.